Between the time I write this and the time you read it, my wife and I will both stand on stage and thank some people after receiving a joint lifetime achievement award. Among those I thank will be you. We will be honored at the New Hampshire Theatre Alliance’s 17th annual awards night at the Capitol Center for the Arts in Concord. It hasn’t happened yet, but you should have been there. While I’m a little puzzled what earned us this honor, I’ve heard that in a small, collegial state like ours, if you remain in the public eye long enough, someone will eventually either award you something or arrest you. In fact, both my wife and I got hooked into local theatre back when my kids were, well, kids, and we’re still involved in a variety of ways. Maybe it’s just our turn, but it’s also a chance to reflect on what our “achievement” has actually been over the years. In a nutshell, what we (and so many others who deserve recognition) have done is simply help other people get together in meaningful ways. Neither of us cured cancer or built a stairway to the stars. We just facilitated and added a little charm to events that draw like-minded folks into the same room. Then we stood back and watched what happened. For my wife, that has occurred mostly at the independent movie theatre where she works in Concord (Red River Theatres). Among her feats, she’s connected the worlds of stage and film at a number of special screenings and events. For me, there’s this magazine. There’s also the fact that the NH Theatre Awards were originally dreamt up by an old (way younger-than-I) friend and me here in the McLean Communications offices. Both these roles have revealed to me what the simple act of getting the right folks together can do. McLean hosts a variety of awards where professionals come to get a chunk of Lucite and a round of applause, but what’s really going on is in the background — names being learned, relationships being forged, opportunities being seized and ideas being shared — all before the door prizes are handed out. The NH Theatre Awards brings theatre companies of varying budgets and missions from all parts of the state together throughout the year as adjudications take place, and then invites them all to a big awards night and party. This kind of cross-fertilization sounds like a good thing for creative folks, and those involved will assure you it is. In the years since the NHTA first handed out an award, North Country stage companies, professional and amateur, have made the trek down to big-city and small-town theaters to judge community and even children’s theatre productions. The plan works both ways. Big, well-funded southern-tier groups like Nashua’s Actorsingers and the Community Players of Concord send emissaries up to experience tiny playhouses like the Little Church Theater in Holderness or historic ones like The Barnstormers of Tamworth. The result is that our theatre community is, in fact, a community: a stable source of real creative power. Such community power doesn’t always manifest in big, award-winning ways. It’s the many small and unremarkable connections that might make the biggest difference in our lives. That’s why our cover story this month is about more than the delights of shops that offer customers an invitation to sit and strum a guitar, read a book or nosh on a pastry. Shops, cafés and occasions where people meet to chat and dream perform a vital role for us all. They bring people together in a world in which just about everything, from politics to technology, seems intent on keeping us apart. 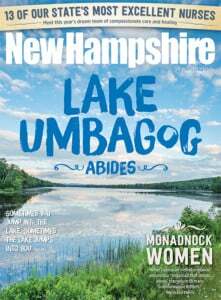 So, along with my mom and God, I plan to thank you, our readers, for coming together each month to spend time with New Hampshire Magazine. We couldn’t do it without you.